During The Voyage of the Damned, the Doctor gets a new female companion with Kylie Minoque playing a waitress on board the Titanic. Back in the 1960′, when Doctor Who first began, there was another science fiction show which featured many beautiful woman guest stars. A fan has uploaded a gallery of The Galactically Hot Women of Star Trek TOS. While there are not many new television shows on this month, many of the talk show hosts plan to return in January. David Letterman’s attempts to negotiate a separate deal with the writers fell through today. Comedy Central has announced that The Daily Show with Jon Stewart and The Colbert Report will resume production on January 7. 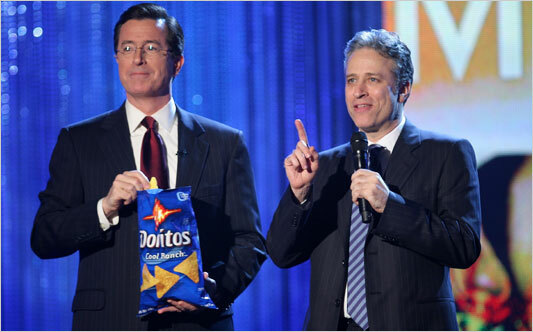 In a joint statement, Stewart and Colbert said: “We would like to return to work with our writers. If we cannot, we would like to express our ambivalence, but without our writers we are unable to express something as nuanced as ambivalence.” Without writers to write the fake news, will Jon Stewart have to resort to reporting the real news? A Mormon may or may not be able to win the Republican nomination, but Todd Herzog, the gay Mormon flight attendant, won Survivor China as most expected. There was a point in which I thought that Amanda might manage to pull it off, but she made a fatal mistake in Survivor. Amanda stuck to her original alliance with Todd instead of betraying him out when she had immunity and could control who made it into the final three. While Amanda was honest, and therefore lost, we did see some deceit in the reunion show following the finale. Denise claimed that she lost her job as lunch lady due to being on Survivor and was forced to take a job as janitor. Producer Mark Burnett felt bad for her and awarded her an extra $50,000. It turned out that Courtney might have been right about Denise sucking at life. On Tuesday her school superintendent said that Denise had been promoted, at her own request, to custodian before Survivor filmed and the job included higher pay. Denise had decided while Survivor was filming that she wanted to get back to her old job but it was no longer available. After having this lie discovered, Denise donated the $50,000 to charity. Deception is necessary while actually playing Survivor, but often backfires in real life. So how might the Obama theory of change work? I’ll give two answers, one entirely mundane and one a little cosmic. The mundane answer is just congressional math. The most important fact about the next administration is nothing about the president’s character or policies, but simply how many Democratic Senators there are. To get health care passed in 2009, we’ll need 60 votes in the Senate. There won’t be 60 Democrats. So a Democratic president will need to, first, get within range by bringing in Democratic senators from Arizona, Colorado, Virginia, and several other red-trending-purple states. And then, subtract the total number of Democrats from 60, and that’s the number of Republicans you’ll need. If that number is two or three, almost anything is possible. If it’s five, it will be much harder. If it’s eight, impossible. This is the math of bipartisanship. It’s not a matter of sitting down with thugs like John Boehner and splitting the difference, but winning over just a few Senate Republicans from outside the South. And if the number is small enough, that’s entirely possible. This is not 1993, when the Republicans could see that a majority was just around the corner, and the conservative takeover had given it a coherence and enthusiasm. It will be a party in some internal crisis after losing both houses of Congress and the presidency in short order, and the sense of a “party establishment” will be weaker. There will be an effort to hold the party together in united opposition, but the ties holding a Senator Snowe, Voinovich, Grassley, Lugar or Specter to a strict party line — as they contemplate retirement, legacy, and their own now-Democratic states — will be much weaker than in either the Clinton or Bush eras. Obama’s approach is better positioned to take advantage of this math. First, I think (though if I tried to prove it, I’d be relying on useless horse-race polls) that Democratic Senate candidates in red/purple states will do better with Obama’s national-unity pitch at the top than with Senator Clinton. I worry about the Senate seats in Colorado (where she polls poorly) and Arizona with Clinton at the top of the ticket, and I think the opportunity to take out Mitch McConnell in Kentucky would be lost. And after the inauguration, I think that opposition to Hillary Clinton will remain a galvanizing theme for Republicans, whereas a new face and will make it harder to recreate the familiar unity-in-opposition. Now for the cosmic explanation: What I find most interesting about Obama’s approach to bipartisanship is how seriously he takes conservatism. As Michael Tomasky describes it in his review of The Audacity of Hope, “The chapters boil down to a pattern: here’s what the right believes about subject X, and here’s what the left believes; and while I basically side with the left, I think the right has a point or two that we should consider, and the left can sometimes get a little carried away.” What I find fascinating about his language about unity and cross-partisanship is that it is not premised on finding Republicans who agree with him, but on taking in good faith the language and positions of actual conservatism — people who don’t agree with him. That’s very different from the longed-for consensus of the Washington Post editorial page. Steve Benen offers his interpretation: “In this sense, the ‘politics of hope’ isn’t about bringing everyone to the table to compromise; it’s about an effective rhetorical strategy to achieve a progressive result.” This is true and a reason why many Democrats support Obama. However, this there is more. The reason that many of us independents (and even more libertarians than you might realize) support Obama is summarized in the final paragraph above regarding Obama’s consideration of opposing viewpoints. We see one example of this on health care. In his heart Obama probably does prefer a single payer health care system as was indicated on an old survey. What really matters is that Obama also understands that a plan such as the one he proposed, without mandates, has a far better chance of being accepted. If you want someone who will try to push the entire progressive agenda down the throats of Americans, Obama is not your candidate. If you want proposals for sensible change that have a chance of actually being accomplished, then Obama may be the only viable choice now offered by the Democrats. Questions continue to be raised regarding Ron Paul’s relationship to white supremacist organizations. Paul has been unable to avoid allegations of racism due to a combination of racist writings in his newsletter under his byline (which he says were written by someone else) and his refusal to return a contribution from Stormfront founder Don Black. While Stormfront has endorsed Paul, there have been conflicting regarding Paul’s relationship to the group. 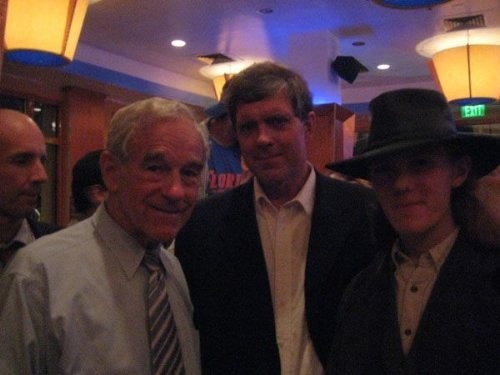 Little Green Footballs has posted a photograph of Paul posing with Don Black (above) at the Values Voters Presidential Debate in Fort Lauderdale on September 17, 2007. This is hardly conclusive as we don’t even know if Paul even knew who he was posing with. My suspicion is that if Paul knew who it was he naively would have still have posed with Black, along with any other supporters requesting a photograph, without this proving any further relationship. Yesterday’s report that Bill White, “Commander” of the American National Socialist Workers Party has stated that Paul has attending meeting with white supremacists remains impossible to either verify or disprove despite all the discussion on line. Receipts have shown that Paul’s office has purchased food at the nearby Tara Thai restaurant, but not on the same days that White claims they have meetings which Paul has attended. While the receipts do not corroborate White’s claims, they do not disprove them either, as some Paul supporters claim. It is possible that Paul met with such groups before his current campaign when there would not be information on file with the FEC. It is also possible that Paul was a guest of these groups and did not pay, or paid out of his own pocket. Ultimately this comes down to whether Bill White’s word as to who attended these meetings can be trusted and it is impossible for Paul to prove a negative that he was never there. I have yet to see any conclusive evidence suggesting anything more than that Ron Paul is naive in failing to understand the need to disassociate himself from these groups, but the writings in his newsletter and his failure to return the contribution from Don Black will keep these questions alive. Paul’s supporters who regularly spam the blogosphere are also not doing him any favors but Paul certainly cannot be blamed for what his supporters post. As is usually the case, the bulk of responses to my earlier post were totally irrational even though it would not have been difficult to write a sane response in defense of Paul. There also continued to be a number of racist and anti-Semitic comments from Paul supporters, which is a strange way to defend Paul from these charges. Some remain conspiratorial in their interpretations, believing I’m out to get Paul. The simple fact of the matter is that if I’m going to cover Paul as a major candidate (which I do more because of the significance of his views than his chances in the Republican primaries) this means that both good and bad news will be discussed. The attitude of Paul’s supporters that only favorable posts are tolerable and any bad news must be suppressed shows the non-libertarian attitude of a large percentage of his supporters who lack any respect for freedom of speech or opinions different from theirs. When Paul’s supporter behave more like brown shirt neo-Nazis than libertarians it is no surprise that stories regarding Paul’s alleged ties to neo-Nazis have traction. The conspiratorial comments included questions as to what corporations paid me to post negatively about Paul, as if any corporations would find him of enough significance to bother. Another couple of kooks claim that this has something to do with Israel even though there is no mention of Israel in the posts. To support their conspiracy theory they have to rely on a post on a pro-Paul blog which makes this argument by outright lying about the content of other posts here. As many of the Paul supporters who submit comments are totally out of touch with reality, have no concept of fact checking, and have little ability to think logically, it doesn’t take anything more than such false claims to fuel their beliefs. Ron Paul has important things to say within the Republican Party about the party moving in the wrong direction on national security and civil liberties issues. It is unfortunate that questions of Paul’s views on race and white supremacists persists but ultimately it Paul’s own actions, along with the actions of his supporters, which fuel these questions. This year’s primary battles might include an unexpected similarity to 2004 when the early front runner appeared to be out of the race and then came back to win. John McCain might be following a path similar to John Kerry’s in 2004. The two names have been connected before. The two reportedly became friends when they worked on the POW issue years after they each served in Vietnam. There were rumors in 2004 that Kerry was seeking McCain to be his running mate, along with more credible reports that it was McCain himself who floated this rumor to improve his own reputation. It would be ironic if the two wind up following a similar path to their party’s nomination. In early 2003 John Kerry was considered by many to be the front runner for the Democratic nomination later fell behind Howard Dean. At his lowest point Kerry fell behind Al Sharpton in the polls and had to mortgage his home to raise money to continue his campaign. After many pundits wrote his campaign off as over, Kerry came back in the final days before the Iowa caucus to win the 2004 Democratic nomination. John McCain also started out the year as front runner and later his campaign was written off as dead. Suddenly, in a campaign where all the front runners have major faults, McCain’s campaign is rebounding. Polls are showing that McCain is surging in New Hampshire. Previously he received the endorsements of The Des Moines Register, The Boston Globe, and The Manchester Union Leader. He added yet another endorsement today from The Boston Herald. I wonder how often the two Boston papers agree on anything. The Boston Herald decided to only endorse McCain and not to endorse a candidate for the Democratic nomination. My feeling is the opposite this year as I only find viable candidates worth considering among the Democrats (but would take a closer look at Michael Bloomberg should he really run and Edwards or Clinton win the Democratic nomination). I could never support McCain due to his views on Iraq and on social issues, but in some ways he is preferable to many of his Republican opponents. At least McCain is not in denial over global warming, opposes torture, has tangled with the religious right, and does not share the xenophobia of many Republicans on immigration. Considering the values of mixed government, having McCain as president and checked by a Democratic Congress would at least be a big improvement over the Bush years. It is impossible to predict the result of primaries this far out as a tremendous number of voters don’t make up their minds until the final days. It is not even clear if newspaper endorsement make a difference, but they do provide credibility to a campaign which was previous written off as dead. McCain may or may not win but he is now one of the viable candidates in the race for the Republican nomination. John Edwards has made a career of finding ways to seek more wealth and power for himself while claiming altruistic goals. This includes his law career, his use of a Senate term primarily as a launching pad to run for the 2004 nomination, working for Fortress, supposedly to learn about the business while claimed no knowledge of any of the more unsavory actions going on, as well as his current populist campaign aimed at Iowa Democrats. A new ad praising Democratic presidential candidate John Edwards for his positions on behalf of American workers is coming under fire by rival Bill Richardson’s campaign, which says Edwards invested in a fund they allege has a role in the shutdown of Newton-based manufacturer Maytag. The television ad by Working 4 Working Americans touts Edwards’ plans to end tax breaks for companies that move American jobs offshore. The political organization is backed by the members of the United Brotherhood of Carpenters and Joiners, which has endorsed Edwards in the primary fight. But Richardson’s Iowa campaign director, Robert Becker, said the ad ignores the role of management firm Fortress Investment Group, where Edwards worked as an adviser, in closing Maytag’s Newton plant. Fortress held stock in Whirlpool, the company that bought out Maytag and shut the company’s doors. The article provides responses from the Edwards camp and concludes by mentioning similar criticism from the Obama campaign. After bringing in another six million dollars recently, I commended Ron Paul for discussing how he would use the money for trying to bring out the vote in Iowa, but also suggested he make more professional ads. His latest ad is posted above. On the one hand the ad is more professional. On the other hand it lacks the aspect of Paul’s campaign which I found of value. There is a vague reference to defending freedom but no talk about the infringements on civil liberties under Republican rule, as well as no talk about getting out of Iraq. The ad is clearly aimed at the conventional Iowa Republican voters and avoids the issues which will offend them. Realistically I can’t blame him for this as all along I’ve said that he can’t win because his views are too out of step with the majority of Republicans. If he wants to win he needs to sound more like this ad. The problem is that he is still unlikely to win and we don’t need another generic Republican in the race. Most likely this ad is only one part of his campaign and he will continue to criticize establishment Republican policy on the war and civil liberties. Paul even criticized Mike Huckabee’s Christmas ad recently, quoting Sinclair Lewis who wrote “when fascism comes to this country it’ll be wrapped in the flag, carrying a cross.” While the conservative sites got all upset over this, with several misquoting Paul as saying he was calling all Christians fascists, Paul actually took a step back and said he wasn’t sure if the quote was a fair assessment. The videos of the Huckabee ad and the interview with Ron Paul are below. If there is any benefit to Ron Paul being in the race it is as an insurgent candidate. As he is in the race to promote a message as opposed to having a realistic chance of winning, and as he is now well-financed, Paul very likely will be in the race until the end. Other candidates might drop out in the name of party unity, or due to lack of funds, once they find they cannot win. Ron Paul might be the last candidate standing to oppose the eventual nominee. If that happens, I hope that Ron Paul is talking about Iraq and civil liberties, as opposed to running such vague ads, all the way until the Republican convention.